I'll start off with some basic stuff-- when did you start playing guitar and music in general? I started playing bass guitar when I was sixteen, and a couple years after that I started played acoustic guitar. What were you interested in playing when you first started? When I was playing bass, I was mostly playing in garage and punk bands, but I was really only into bands from San Francisco like the Melvins and stuff like that. How did you progress into the Six Organs stuff you do today? I don't know, I guess when I was 19 or 20, I picked up an acoustic guitar and it kind of clicked a lot more with me. I grew up in a small town called Eureka, and there was really nobody at the time playing that sort of thing up there, so it was just interesting, and I became interested in acoustic music at that time. Do you feel like your early interest in punk still has an influence on you as far as Six Organs is concerned? Well a little bit. I think as far as writing words and songwriting goes, I think King Buzzo is great. Nobody ever really talks about him as a songwriter with words or anything, but I've always been pretty stoked on his lyrics. They don't really make any sense, but they sound great phonetically, like a song like "Night Goat" or something, it just sounds great, so actually, even on the last record, I was consciously working with the words in sort of a King Buzzo realm. That's a good segue, because I was going to ask you about lyrics-- it seems that over the past few Six Organs releases, lyrics and singing have become more important, like your voice is more central in the mix. A little bit, but it might change. I look at every record as its own thing, and I'm working on some recordings right now where I don't have any singing and just kind of some wordless vocals, but it seems like everything has been getting more and more toward the last record, which is more singing than I've pretty much ever done, so yeah, for sure. Was that the result of a change in what you were interested in doing or do you feel like you've become a better singer and have more confidence in your vocals? (laughs) No, definitely not, I don't feel like I've become a better singer. I'm pretty aware of my limitations as a singer, which is why I never really sang much in the first place. I just go record by record, because the record before this only had a couple songs with singing, and the rest had sort of wordless vocals, so before I even start to write a record, I think whether or not it's going to have a lot of songs on it, and I let the record write itself. Yeah, I guess a better way to phrase it would be that it seems that you've been more focused on lyrics with words as opposed to the earlier stuff which is more wordless. Yeah, I guess I have, yeah. How do you go about writing lyrics? What inspires you and where do you draw your lyrics from? Usually there isn't like one subject. On this record there actually were specific subjects that I talked about, but usually it comes from different things. Like on School of the Flower I was working on songs when my friend was doing a movie so I kind of wrote lyrics based on his movie. I usually end up writing late at night and kind of pick stuff out later. What were some of the subjects you were addressing lyrically on the new record? Lets see. It usually comes from stuff I'm reading at the time, and at the time I was writing this record, I was reading a lot of Paul Virilio , so I was kind of concerned with technology and speed and impending accidents that he always talks about. I'm not familiar with his work, could you tell me a little about it? He's a French theorist and he really talks a lot about speed and how speed comes before power, and in recent pieces he talks about how any sort of technological advance sets up the idea of accidents, so he says that when the locomotive was invented, so was the crash, and when the car was invented, the same thing, a crash. And so then you have nuclear technology with accidents, and with bio mechanics, he talks about the possibility of accidents as well. When you read him, he seems kind of doomsday from one angle, but it's more like a warning, like "hey, pay attention to this kind of thing," so that was what I was reading when I was writing the lyrics. I can't really recommend one particular work by him, but if you get into him, there's stuff all over the Internet about him, and he's pretty awesome. That's interesting because when I was preparing for this interview, I read the interview that you did on Pitchfork, and one thing that I found interesting is when the interviewer starting asking you about nature and spirituality, you commented that you kind of agree with Werner Herzog's thoughts regarding nature being more about death and chaos than anything else, and I wonder how that view ties in to these lyrical themes on the new album. Well I was being a little dramatic when I told him that, you know, for the sake of an interesting read, but I think it's so easy in music, in a post new age movement, to talk about nature and be all "hey, we're a bunch of hippies," but if you really look at nature, like the winter time we're in right now, it's kind of brutal, you know? Yeah, when I listen to Six Organs, it feels meditative to me and it has this organic quality that does make me think about nature and Thoreau and all this stuff, but it doesn't seem like an entirely pleasant or optimistic take. And that is something that I find interesting too because natural forces in the world around us are always brutal and often unkind and unpleasant, or at least less than ideal. Yeah, absolutely. And beautiful too. It's a balance. And I think you're right, that is something that tends not to be explored as much in pop music, particularly from artists from places like San Francisco, which people always associate with hippies and good times and positive attitudes. Yeah, it's a bit of a curse that I live in San Francisco, I mean, not the actual living situation, which is awesome, but when it comes to people pinpointing musical styles I just want to say "No, No, I just live here because I have to live here!" It's not because of any scene or anything like that. Yeah, people forget about the Dead Kennedys a lot, huh? Yeah, totally, exactly. Or Crime or whatever, you know? So on this new record, the sound was a lot more clear and crisp to me, and a bit less noisy and muddy. Do you agree? Yeah, it wasn't really conscious, it's just the way it worked out. I recorded this one and Sun Awakens at the same studio, and School of the Flower was recorded at a different studio in Michigan, and those were the only times I've ever really recorded at a studio. Yeah, I can understand the difference with School of the Flower because it was a different studio, but maybe Tim had some tricks up his sleeve or something this time, I don't know, but it just sort of turned out that way. 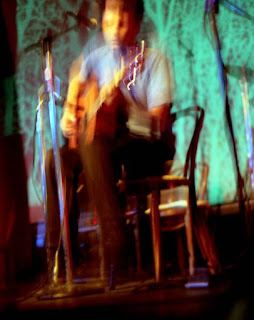 One of the things I enjoy about your music is what sounds to be the contrast between opposing forces-- there's a gentle undercurrent to your acoustic guitar and singing, but then you seem to have a lot of drone and dissonant noise going on a lot in the background. Do your interests in drone and noise as opposed to acoustic music come from separate places, or do they all come from the same place? For me they all kind of come from the same place. I remember there was a point when I couldn't put the two together or figure out how they worked together, and at the same time I started playing acoustic guitar, I started having a pretty healthy interest in pretty extreme noise guitar, and I couldn't figure out how to put them together, and I was doing all these projects and recordings and they just weren't going together. But at some point, I realized how they could go together and that is sort of when Six Organs started as a project, trying to put those things together. So originally, they were seperate, but now I see them together. I try to create something beautiful and scary and all together. I just have such an aversion to new age music, and it's funny because sometimes I get described as that, like a "totally mellow listen," and that's fine, but I actually don't enjoy mellow listening stuff and don't listen to it. Well I've seen it mentioned that John Fahey was an inspiration for you, and you always hear people reference him as an accidental precursor to new age music. Yeah, it's weird, people have said he was a big influence on me, and I think if you pick up an acoustic guitar, anyone is going to say that he's an influence, but I've actually consciously chosen not to play like Fahey, and I'm actually much more interested in the British guys rather than the Americans. But yeah, he did kind of start it, but he didn't like it either, which is why in his later years he was recording some of the most dissonant and ridiculous music with electric guitars because I think he realized what he started. So I think he started it, but I think he regretted it. One thing you couldn't call Six Ograns' music is "pop." Do you find that the loose, experimental song structures you utilize allow you to express something that you just couldn't express with a more pop or trad folk approach? Yeah, I don't really have anything to communicate in a pop form. I don't know why I put the sounds down I just do, I just work on stuff, and the things that I like to make are just usually a little more extended. When I do a song that is shorter, or more pop form, it's more kind of a trick to get people to listen to the rest of the record (laughs). It's like "hey, check this out," and then it ends up being a 20 minute song or something. With Six Organs, do you write all the parts of all the songs, or do you ever work with other people? No, not with Six Organs. Six Organs is just me writing. I have a lot of projects with a lot of other people, and if I ever did start working on stuff with someone else, we would probably just start another band. So do you ever find it frightening in a way to work completely by yourself since you aren't bouncing ideas off of other people when you write? I think that I've been doing it for so long that it is kind of just natural to me now. It might have been scary if I had never done it before, but luckily when I started doing it there was no one listening, so I could keep doing it while no one listened, like for three or four records, and ten years later, it isn't that big of a deal to me. What goes through your mind when you read critical reviews of your work? I usually just consider it to be a good barometer of whether I would want to hang out with the person in general (laughs), and with my record, I probably wouldn't want to share a beer with you. If I was making music that everyone liked, then I wouldn't be making music that's good. It makes total sense that a lot of people wouldn't like the music I do, and it makes sense that a few would. I don't really listen to pop music or music that sells many copies, just because of its nature, so it makes sense that lots of people probably wouldn't like what I do. I just take it with a grain of salt. What are some of the differences between playing material in a group with Comets on Fire and playing your own material with Six Organs? What are the different things you get out of it? Well Comets is mostly just about hanging out with friends more than anything. We don't have a lot of creative things coming up because everyone kind of has projects going on and babies and marriages that just happened, but there is still this need for everyone to get together and have a beer and play some music together every once in a while. That is the heart of that band, five guys who are really good friends and just want to play music. That's pretty much the biggest difference. Six Organs is just me and Comets is a total democracy, usually, if it works right. If you had to choose between playing on your own or playing in bands for the rest of your life, which would appeal to you more? If it was just between those two, I would play with other people for the rest of my life, but if you're saying I have to play with the same people for the rest of my life, I would probably choose to play by myself. Aside from musical influences, what else in your life influences your music? It's crazy now, it's just something that is totally natural now. It's like walking around and eating. If there is a guitar lying around, I'm going to pick it up, and a lot of times nothing comes out of it, but sometimes it does. There are all sorts of things. It's rarely a flash where I just get this great idea, like "oh look at that tree," I just pick up the guitar or think about something and go with it. It's just a really natural thing. So when you start writing material, you don't always set out with a general intent or a firm idea of where you want to go with it? It's more of a random trial and error? Well there is actually a specific listening trajectory that I always think of, like where the piece is going to go, and what you'll think about on the way, and once I think about that, I figure out how to do it. I always construct the records as a whole piece rather than a collection of songs. So someone downloading a Six Organs MP3 off a blog isn't going to get exactly what is going on unless they hear the whole record? Well I guess, but I think about it more cinematically. You can watch a great scene from a great movie and be like "oh, that's great, lets watch it again," so the trick is to be able to do both, to do something that people can pull out if they want to, because I'm not a dictator, I'm not going to force people to listen to it a certain way, so the trick is to be able to make something that you can listen to any way, even backwards. It's just that the full album is the only way I conceive of the material when I'm making it. Does Comets or Six Organs have any new material coming out? Comets is taking a break, Ethan is taking Howlin' Rain out for quite a while, and for Six Organs, as soon as I get back from tour, my friend just wrote this novel called Empty the Sun, and I'm going to do a soundtrack to the novel. It's funny because that will actually be the first Six Organs that is written with other people, but it will be me and my friend Steve, writing music for the novel, and we're going to go down to his house in Los Angeles and record it. You don't really hear about novel soundtracks. Yeah, that was my friend Joseph's idea. He said "everyone writes soundtracks to movies, so why don't you write a soundtrack to this novel I'm writing." And I said "let me read some of it," and he was kind of just getting going, and I read the first chapter and thought it was awesome, and I said "lets do it." He just finished it this week, actually, so he's going to hand it off to me in Los Angeles. Will you distribute the novel and soundtrack together? Yeah, we want them to be together. And the music can be listened to by itself or while you're reading. It's slightly ambient as a soundtrack and it's a good driving record, because it is kind of a road story. There are a lot of different factors going in to it. Thanks for that! Ben's amazing and I can't wait for the show! "Good piece. I hope this guy knows the Melvins were not from San Fransisco though...."
Not originally, but they moved there many years ago. Like in the 80's. what time is dust congress tonight? I'm not sure exactly, but they play second, and J Gray is supposed to play first and go on at 9 (20-30 minute set), so I would guess around 10 or 1030.
can I get an it list? i agree, and we've got a solution to it. You'll find out what it is very soon.